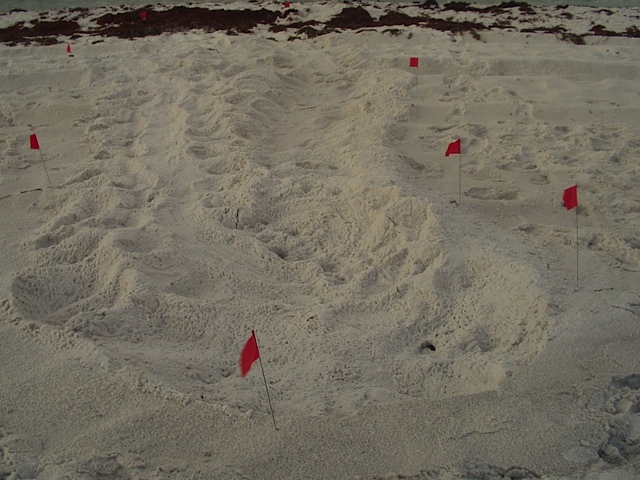 Nest #18 has hatched and been dug. Busy morning! 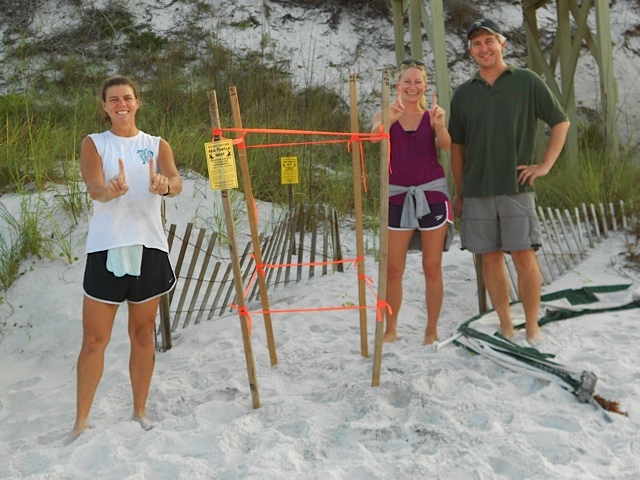 Wayne found 2 nests and one false crawl…..Jennifer found a false crawl and 2 others at the other end, Joey and Dawn, each found nests! 4 nests in one morning! Photos here of nest 16. 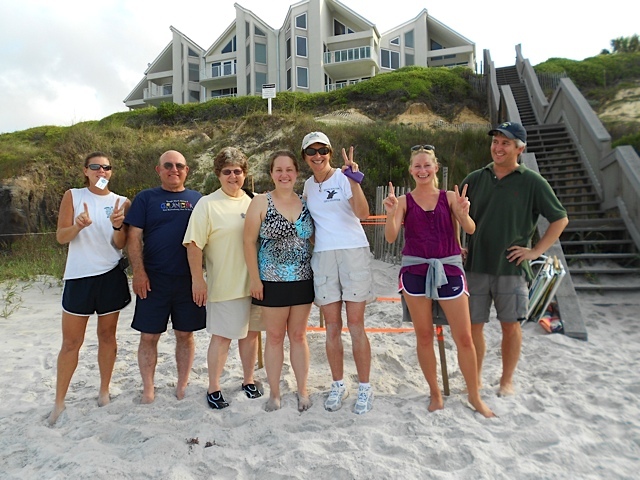 Both our nests were found in Alys Beach……you sure are missing a lot of action Al! Kate takes new data on nest 16. Nest was moved due to being so low to the water edge. 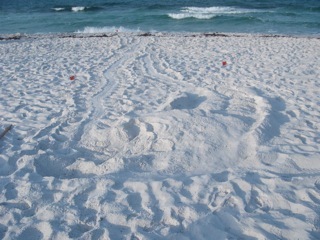 Even tho the tracks say Loggerhead, the hatchlings say Green with the white bellies and white fringe around. False crawl was in Inlet. It looked like a nest, but wasn’t. Nice crawl though! See the drag under her shell? Notice if you see that again on any of your tracks. Tobias, poses by nest 15. She nested nice and high! 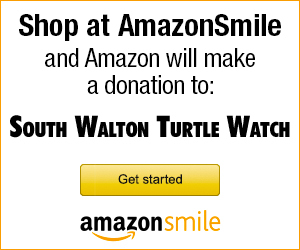 Found by Angela at Journeys End next to nest 13. It took us a while but we found the eggs X marks the spot. Friday June 1, loggerhead at Journey’s End, Dune Allen. We had a bit of crowd at nest 12. The family who watched it hatch were there. They were full of questions. After we were done with the nest and everyone left, 3 young folks came up to tell us the ‘real’ story about the hatching. 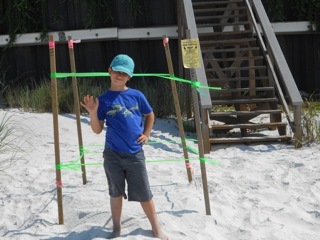 They said it was a mess and everyone had white flashlights all over and they were chasing after turtles and ran to get their nets to catch the turtles out of the water! The young folks said they called the number on the post and couldn’t get anyone. They called the sheriff who got there after everyone was gone and of course, done. I don’t know why the sheriff didn’t call you. Hurrah Eastenders, wow, they sure are here. Wayne is doing a great job. 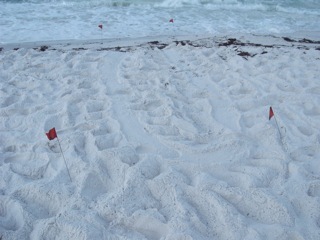 Thursday May 31, Loggerhead nest on Rosemary Beach Nest #11.